Members at Hazel Hawkins Memorial Hospital in Hollister showed their colors Friday, October 2, wearing red and sporting NUHW buttons, lanyards, and stickers (photo above). It was an effort to show the hospital administration that members are united in the contract bargaining fight. For the third time in five years, Children’s Hospital workers voted for NUHW over SEIU. SEIU is of course challenging the results of the September 21 election but we fully expect that NUHW will be certified as the winner of the election. 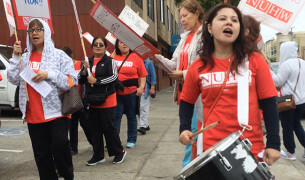 NUHW members on strike at San Francisco Nursing Center. The National Labor Relations Board sided with NUHW in a dispute with Providence Group, the new owner of San Francisco Nursing Center. NUHW filed an unfair labor practice charge over Providence’s unilateral decision to eliminate SFNC workers’ Kaiser health plan and replace it with an inferior, more expensive plan. More bargaining is scheduled this month. Bargaining continues at several NUHW workplaces in our Hospital and Nursing Home Division: Keck Medical Center of USC (Service and Tech), Keck USC—Sodexo, Sutter California Pacific Medical Center, St. Joseph hospitals in Humboldt and Sonoma counties, Hazel Hawkins Memorial Hospital, Salinas Valley Memorial Hospital, The Sequoias, San Rafael Healthcare and Wellness Center, and San Francisco Nursing Center. Bargaining also continues in three of our Kaiser units: Healthcare Professionals, Psych-Social, and IBHS, where members are nearly finished voting on whether to authorize an open-ended strike.